Helena Cobban:0:00Okay. Today on Just World Broadcast, the two-state solution is dead. Let us start planning to the one-state.no. 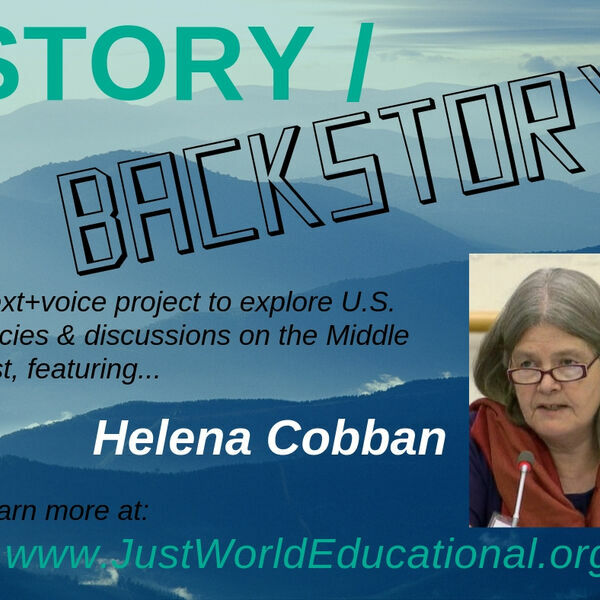 Helena Cobban:0:20Hi, I'm Helena Cobban, the president of Just World Educational and this week's broadcast is the third in our series Story-backstory, which explores various aspects of Washington's current policies in the Middle East within a broader historical perspective. Each week in this project, there'll be an opinion column that I write that will be published on the Wednesday, generally on the great Mondowiess news-site. Then, a few days later I'll follow that up with this expanded audio version that we'll start off with me simply meeting the column and after the reading I'll provide yet more backstory on that same topic. This week, we have a special treat. In the second half of this broadcast, instead of me just pining on my own about the one-state two-state issue, I'll be joined by the distinguished scholar and practitioner of Washington's policies in the Middle East, Dr. William B. Quandt to whom I have been married for as it happens nearly 35 years now. And we're able to share with you what I think is a pretty interesting and informative conversation we had on this topic. :2:32Washington DC March 5th, 2019-- In the US political mainstream, expressing support for the two-state solution in historic Palestine has been routine for many years now, but anyone who looks at the map of the settlements Israel has implanted into the occupied West Bank, including East Jerusalem, has to conclude that withdrawing enough of them provide territory for a viable Palestinian state is now politically impossible. Helena Cobban:3:06The demographic egg in the West Bank has been thoroughly scrambled and cannot be unscrambled. This leaves diplomats around the world with two options. Either the project to establish a Palestinian Arab entity must be yet further truncated into, for example, creating a necklace of tiny Palestinian Bantustans in some parts of the West Bank and Gaza. A formula now reportedly being considered by Jared Kushner or the long pursued project to build separate Israeli and Palestinian entities in historic Palestine should be ditched in favor of establishing a single democratic state there in which all persons with a legitimate claim to belonging can enjoy full civic equality. Everyone who believes in the equality of all human persons including Palestinians would surely opt for the second of those choices. I leave it to others to write a full obituary for the two-state solution. My goal here is to explore what it would mean at the level of international diplomacy to leave behind the two-state model and start to pursue the one-state model instead. Helena Cobban:4:26The two-state model dates back, not just to 1967, the year Israel's well-honed military occupied the West Bank, Gaza, Golan and a big chunk of Egypt. It dates to 1947, the year the British government exhausted after World War II and seeing its global empire crumbling, summarily dumped the Palestine question into the lap of the still-young United Nations. Partition of conflict-plagued areas was enjoying quite a vogue in those years, for example, in India and Germany. So, without a lot of planning, the two powers then at the apex of the world system, the United States and the Soviet Union, united around that formula for Palestine. Interestingly, the Soviets were hoping Israel could be a thorn in the side of the British empire, which still tightly controlled the governments of Egypt, Jordan and Iraq. And for some years that did happen. When United Nations was founded just two years earlier in 1945, its charter duntley proclaimed respect for the principle of equal rights and self determination of peoples. But in Palestine and several other countries still under the yoke of the British or other European empires. those principles were set aside. Helena Cobban:5:56In 1947, the UN's member nations voted 33 to 10 with 10 abstentions to partition Palestine. In doing so, they rode roughshod over the aspirations of the more than two thirds of the country's population that was Arab, who strongly opposed partition. Instead, the UN's vote privileged the desire of the less than one third of the population who were Jewish to have a state of their own. David Ben Gurion, who became Israel's first prime minister, privately told family members he saw having a Jewish only state in just a part of Palestine as a stepping stone to having one in the whole of the country. The Partition Plan allocated a disproportionate amount of the land to the Jewish state, but even that was not enough for Ben Gurion and his cronies. The UN passed the Partition Plan on November 29th, 1947. It was not supposed to come into effect until the following May, but from November 29th onward, the well-organized militias that existed in the Jewish community set about two tasks. Helena Cobban:7:13They worked to expand the areas of Palestine that they controlled and they worked to ethnically cleanse from all those areas the Arab residents who actually made up a majority of those areas' population. Those expansion and ethnic cleansing operations continued from late November, 1947 until early 1949, when all the Arab states bordering Israel signed longterm ceasefire or armistice agreements with it. During the fighting of 1947-1949 the Palestinian Arabs had only weak and fragmentary means of self defense. A decade earlier, they'd launched an uprising against Britain's rule in Palestine, which the British military suppressed very brutally. So in 1947-49, the Palestinians had no malicious capable at all of matching the Jewish communities' Haganah, Palmach or Itsil fighting groups. The nominally Arab armies of neighboring Egypt and Jordan was still under tight British control. They stayed completely out of Palestine until after May 15th, 1948 and even then, they were careful not to provoke the Jewish Israeli fighters. Helena Cobban:8:40The King of Jordan showed his contempt for Palestinian self rule when he annexed the West Bank in 1949. The king of Egypt was content merely to bring Gaza under military occupation. It's important to understand this history, because if we want to support the idea of a single democratic state in all of Palestine, we need to understand what it'll take to achieve it and it won't be easy. It will involve ending the institutionalized privilege for Jewish people in Palestine, the vast majority of them colonial settlers that the state of Israel has embodied ever since 1948. And at the international level, it will involve persuading enough states in the United Nations that the partition of Palestine, that the UN itself pioneered back in 1947 has to end. There are some glimmers of hope. One of the other key partitions of the late 1940s has already collapsed. East Germany and West Germany peacefully reunited back in 1990 and just last week, the International Court of Justice in The Hague ruled that a step that Britain took in 1965 to detach the Chagos Archipelago from Mauritius a few years before Britain granted independence to the thus-truncated Republic of Mauritius was unlawful. Britain, the ICJ ruling said, should end that unlawful partition of Mauritius and hand the Chagos islands back to Mauritiu. It's true that ruling was only an advisory opinion and like the ICJ's 2004 opinion on Israel's war wall in the West Bank, it is not self-enforcing. Still reading some of the detail in the ICJ's Chagos islands ruling offers some intriguing possible precedence for those seeking to challenge the legality of the UN's partition of Palestine. Helena Cobban:10:56In late 1991, Israel's rulers had an amazing opportunity to make peace with all their neighbors, including the Palestinians. That year, all those neighbors met Israel at the Madrid Peace Conference with a common aim of winning a final piece based on the principle of land for peace. It would have been a two-state peace. Jordan had renounced his claim to the West Bank in 1988, Egypt had never claimed Gaza, and the PLO was clearly representing the interests of all the Palestinians at Madrid. Since 1991 however, successive rulers of Israel from both major parties have consistently chosen colonial aggrandizement over peace. And now because of the success of that settlement building project, the chance for a two-state solution is gone. There is one respect in which winning a one-state solution should be easier than continuing to search for two-state peace. Helena Cobban:12:03In the context of any two-state based negotiation, the matter of that large proportion of the Palestinian people who were ethnically cleansed from their lands in 1947-49 was always extremely hard to address. Under international law, these refugees and their descendants all still have the right to return to their original homes if they are prepared to live there at peace with their neighbors. No Israeli government since 1948 has been prepared to let that happen. So long as two-state focused negotiations continued, numerous conferences were convened with the goal of finding other outcomes for the refugees. But if we're looking at a one-state solution, then anyone who supports the idea that Palestinians are fully human and that their rights actually mean something, will surely be out there loudly supporting the Palestinian refugees full right of return. These chronically vulnerable Palestinian families have been living in the squalor of the refugee camps for more than 70 years. Helena Cobban:13:17Most of them are stateless all have suffered greatly from political turmoil in Jordan, Lebanon, Syria, or Gaza or the West Bank, and they've never had any capable state apparatus of their own to protect their interests or even their lives. If in the context of an egalitarian one-state solution, Jewish-Israeli settlers who live in settlements all over the country are allowed to stay and live in peace and equality with their neighbors, Palestinian refugees, now barely surviving in Lebanon, Syria, Gaza, or elsewhere should surely finally be allowed to implement the UN sanctioned right of return. A one state outcome could enable that to happen. Helena Cobban:14:12So that was the column, and now just before we get to the part you've probably been waiting for, let me put in a quick plug for our website, which is www.justworldeducational.org. There you can learn a lot more about Just World Ed and you'll find links to our social media accounts on Facebook and Twitter. You'll also find a handy tab on the website that tells you how you can donate to support our timely educational work. And now the conversation that Bill Quandt and I had on the one-state two-state issue. Well I'm sitting here with Bill Quandt who was a very distinguished leader of much of the United States diplomacy on Arab Israeli matters back in the 1970s. He also happens to be my spouse of many years and we discussed these matters very frequently to the point that our children kind of roll their eyes and say, Oh, mom and dad are at it again. But anyway, here we are continuing our discussion this time on air. And I just recall that on this issue of one-state two-state, we had an earlier public discussion that kind of fizzled because we didn't disagree as much as I think our hosts had hoped we would. So Bill, I guess you've read the little article that I had on Modowiess in early March. And I wonder if you have any criticisms or questions or things you want to discuss more. Bill Quandt:15:52Yes, I did read it. I found it very interesting and I agreed with a good bit of it. I would put different emphasis on a few things and would try to urge you and others who are concerned with this to expand on certain concepts. So let me briefly say what I agree with and where I have some different points of emphasis. First, I think, and I say this with some regret that the two-state model as conventionally imagined by diplomats, and for some considerable period of time by many Israelis and many Palestinians, has pretty much lost its credibility and that probably did, as you say in the article, happened sometime in the 1990s, early 1990s or perhaps during that decade. That was really the last chance if there was one to design a two-state outcome to this conflict that had a chance of being accepted by a majority of Israelis and a majority of Palestinians in my opinion. Helena Cobban:17:01Yeah, it's interesting to try to date that. I mean, I am only capable of doing that to the extent of saying sometime after 1991. I think in 1991, there was a real chance, maybe at the time of Oslo there was a real chance. I dunno, maybe in the early aughts there was a chance. But anyway, so we're agreed now that it's kind of dead. Bill Quandt:17:26Certainly short of an enormous act of will on the part of the Israelis to tackle the issue of the settlers who are way beyond the 1967 border. And it's of course possible in the world we live in for dramatic population shifts to take place. After all, most the settlers went there with inducements from their government and subsidies from their government. And if there were a real conclusion on the part of most Israelis that they needed to for their own wellbeing to separate from the Palestinians, they could persuade many many settlers, but not all of them to return. And then you'd have to work out the status of settlers who wouldn't leave. But I don't think it's going to happen. Helena Cobban:18:19I mean we don't have the kind of government or the kind of popular movements in Israel that are trending in that direction. We are trending in the exact opposite direction. Bill Quandt:18:28I'm just saying that what happens by political will and economic subsidies could be, in theory, reversed by political will and economic incentives. But it's not going to happen. So let's not waste a lot of time on how do we revive a dead horse. Helena Cobban:18:45So, what do we do about burying the two-state solution at the international diplomatic level. I mean it's, it's not an easy task? Bill Quandt:18:55No, it's not. And I think I would start by saying that it's not primarily up to outsiders, even outsiders of goodwill. And I think we both would think of ourselves in that category to be the architects of how this should be solved. I think ultimately we need to give voice to Israelis and Palestinians about how do you find your way out of the mess. And I think as outsiders who believe that there are two communities in historic Palestine who need to find a way to coexist in that small area, there are certain things that we as outsiders should say, don't even think about the following. One would be one side expels the other. That is a way of solving the problem. And it's been done in other places historically as in South Asia with the expulsion of, you know, most Hindus from Pakistan at the time of partition in 1947. But I don't think that that, although it could happen, I don't think the international community can give any legitimacy to the idea that transfer of one population out of historic Palestine as a solution to this problem. So, the question is how within this small territory you can have two peoples coexisting with equal rights. Helena Cobban:20:20Can I just jump in? I want to go back to something you said a little bit earlier. We couldn't come back to this question of how you devise the formula, but you did make note of our position as outsiders, which I completely agree. We are outsiders. We are not direct stakeholders in this, but we are citizens of the United States, which plays a huge role and we and other citizens of the United States have in a sense I think some responsibility to right the terrible imbalance and injustice that our government has brought to bear on this. That's one thing. And then another thing you said was, how could we think of these two communities in historic Palestine devising a formula? Well, you know, that's kind had been the mantra of Dennis Ross and the peace processes ever since the Clinton era that, you know, we can't want peace more than the parties themselves. It has to be something that the two of them can agree on. And I really want to take issue with that point of view. And finally, you did mention, like you said, the two communities in historic Palestine, but a large proportion, almost certainly a majority of Palestinians, are not within historic Palestine. Bill Quandt:21:40Okay. Well, you used the term with legitimate claims in historic Palestine. So, we can talk about that as the basis for who has a direct stake in it. I think, you know, I didn't mean that we simply sit back and wait until the parties somehow come to their senses and nurtured along with tiny little steps along the way. But I do also think that a model for a peaceful settlement has to engage the parties themselves. Because at the end of the day, I think they have the right to at least say no. You can't force this. If it's going to be something that deserves the name of peace, you have to have considerable amount of buy by both Israelis and Palestinians. So, if it's going to be something like, some form of a one-state model, it's fine for us to sit around and talk about how that would look and how that would operate. But if you don't have any significant number of Israelis and not all that many Palestinians. Yeah, that sounds pretty good to us. They don't necessarily have to be the architects from the outset, but at some point, you can't just force this down their throat, I don't think. Helena Cobban:22:59I agree. You can't force it down their throat. But you did speak earlier about economic incentives, for example, and you know, political muscle. I don't think that was the exact word you used. And of course our government has been majorly using economic incentives to support everything that Israel has done. You know, with a promise of $38 billion worth of military aid over the next 10 years. Moving the embassy to Jerusalem is not an economic incentive, while, you know, clamping down and punishing the Palestinian Authority or any Palestinian. I mean, economic incentives have majorly used to, in my view, further the Israelis' settler-colonial expansion project. So, there's a lot that our government could do to reverse those economic incentives. And here we're talking not about the Israeli government doing it vis-à-vis the settlers, but our government doing it, vis-à-vis the Jewish Israeli community as a whole. Helena Cobban:24:13Getting back to your point of like. Well, can we get buy in from a majority of Palestinians. To me, that's the very easy part. You know, if you're talking about a one person, one vote system for everybody who is in historic Palestine and who has a legitimate claim on it, that is, you know, the Palestinian refugees, then the vast majority of Palestinians will support this. I think it's only at this point of very tiny coterie among around the Palestinian Authority leadership that clings to some illusion that a two-state solution is in any way viable. So, we could think of economic incentives that we would urge our government. We could call it sanctions. We could call it Boycott, Divestment and Sanctions. That would be a fine idea. But, there's also this conundrum that I sort of explored in the article, which is the political, the diplomatic political structure for this, because we do have this partitioning plan thing. What on earth do we do about that? Bill Quandt:25:27Well, the Partition Plan was a political decision at a certain point in time and you presumably could have a different decision made by the same international body that took the decision on the Partition Plan, the United Nations, to legitimize an alternative. But I want to come to what that alternative could be because you talk about one-state as if there's a kind of single model that comes to mind where you just take, well I guess all Palestinians, which are perhaps easy to identify, at least in principle and then all current Israeli Jewish citizens who live in Israel. But of course, the Israeli project has a different concept of who is entitled to citizenship in Israel and that is any Jew who decides someday that they want to come live there. Do you say that potentially the new state would uphold the right of return for all Jews? And I think most Palestinians would say that's not the kind state we envisage being a part of. So there are issues at the outset of what kind of state is this? How do decisions get made? And on this issue of who in fact are current citizens who would have a right to live in it and who are future citizens who would have the right to live in it. Those are all things that are not easy to get agreement on. So I'm just saying that a single unitary state with one person, one vote, no differentiation between Jews and Arabs in it is one model and I think it's the model designed to ensure that very few Jewish Israelis would sign onto. There's another model of one state where you might say that you can have a single political unit, let's call it India, within which you have multiple states that have quite distinctive national identities including languages and even to some extent religion, but mostly language, but quite different sub-cultures. Bill Quandt:27:53But they all share a common statehood. They can all vote in national elections, but they also vote in local elections, which means the state governments are quite powerful and in that kind of a state, you have two levels of identity that are quite important. You have a national identity and you have a state identity. It's also perhaps a Belgian model, whether it's a good model or a bad model. It's a single state, but not exactly a unitary state. You have a linguistic, ethnic or linguistic concentrations, but if you happen via Flemish speaker wants to live in the French part, you can do so without any permission from anybody else and vice versa. So I think if you begin to kind of unpack the notion of this single state say, could it have a Jewish predominant canton with far reaching control over local matters, religious matters, language matters, education matters, and perhaps even the right for Jews elsewhere to apply for living there and get special kind of privileged to live there. Bill Quandt:29:06Whereas on the Palestinian side, you would have a different, cultural and linguistic, but they would all share in a common space as well. I mean, it's complicated, but this is never going to be easy. And I think unless you recognize some differentiation between the primary communities in Palestine where each can feel it has some considerable control it and there's no risk of being overwhelmed demographically by the other side. Even if the numbers go up on the Palestinian side, it doesn't dilute the Jewishness, Hebrew-speaking quality of the Jewish side or potentially vice versa. Let's say that someday Palestinians get fed up with the experiment and they migrate and give up their citizenship and all of a sudden the Jewish part of the community has the upper hand. I think you have to anticipate a one-state model, it has strong components that don't just dissolve in the face of one another. Helena Cobban:30:14I think that's probably true. We could look at Canada as a model? Sort of a bi-cultural model under her majesty, the Queen, or whatever it is. I don't recommend that by the way. Helena Cobban:30:30Now let's not even go there. I think most of the people that I know of who are Israelis and Palestinians who are supporters of the one-state project, and there are a lot on both sides of the national fence are obviously wrestling with these issues and they will continue to be conferences and gatherings at which people, you know, wrangle about them and try to work out these different formulas. The missing piece I'm seeing is clear political leadership from either community in this direction. Because, you know, as you say, it something that the communities themselves have to buy into. And it really, those kinds of details of whether you have a consociational democracy or a confederacy or whatever. That's really for them to discuss and to come forward with a compelling vision that could persuade the international community, you know, wow, this is a great project in the way that, the ANC did in 1955, when they said the settlers can stay here in South Africa, in the new South Africa that we want to build. And that was an amazing breakthrough. There were lots of people in the South African liberation movement who disagreed with that, but that was ultimately what happened. it hasn't solved everything, but you know, there's a lot of economic issues yet need to be resolved there. But we're not seeing anything like that from the Palestinian community right now. because not only Fatah, but also the rest of the PLO, but also, Hamas has kind of gotten into a sort of a two-state-ish groove and hasn't done a whole lot. I mean their support for the two-state outcome is very guarded, and you know, they only see it as being a transition on way to a single-state, you know, the period of the Hudna or whatever. But, they haven't done a lot to really flesh out what their one-state of the future would look like. So, there's only so much that we outsiders can do I think. But maybe what we can do is start to raise some of these issues here in the United States in particular, you know, where our support for this apartheid or apartheid-like state in Israel is something that we have to take responsibility for our government's policy. Bill Quandt:33:15That's a good point. I do think we're going to see before too long some kind of a transition on the Palestinian side to new leadership, but we should hope that there will be new voices articulating new ideas, because it's pretty frozen for a long time. And on the Israeli side, you know, there are individuals who are open to lots of interesting ideas, but the, the formal structures are pretty pathetic. But let me just say as you know, I rarely say praiseworthy things about the American President, but he did say on this issue, kind of off the top, he said that he didn't much care whether it was one-state or two-state, said that he could support either. He later amended that he thought the two-state was a better way to go. But in some ways, I think he didn't get as much negative reaction to that off the cuff comment, because for most Americans, the kind of one-state that we're talking about, which is a decent democratic rights respecting place, does not sound threatening and shouldn't sound threatening. Bill Quandt:34:25So I don't think there should be a closed mind about it here. I just think there's a lot of work to do to make it sound plausible, realistic. And at some point we have to start hearing from Israelis and Palestinians that yes, and it's better than occupations, a nonstarter for a peaceful basis for the future. Occupation is what we've known for the past far too many years. Expulsions unacceptable and the two-states solution that everybody talks about is no longer credible. So it can be done. The only thing that I still worry about is that it sounds appealing, especially to kind of secular Westerners who have lived in communities that have kind of struggled with these things in more or less showing that it can kind of work to have a stake within which we have multiple identities and we coexist, so forth. Helena Cobban:35:33And now increasingly Spanish language here in the United States. Bill Quandt:35:35Yeah. I mean, it is a model that works. We have many places in the world where it works quite well. But I think the transition from where we are today to get in Palestine to a single-state is going to be the work of a generation, not the work of a few years. And that's what if we're serious about it. it's not so much people, my generation who will make it happen. It's gonna be the work of a full generation, because look how long the occupation has gone on without being able to implement what was what would have been a much easier outcome. Helena Cobban:36:20Well, it could have been implemented had our government been prepared to do what Eisenhower did in 1956. Bill Quandt:36:27You know, partition was the model, not just since 1947, but since the mid 1930s when the British started thinking we are not seeing that this is coming together as a potential single state. They started thinking about partition and came up with a Partition Plan, which was a better thought out partition plan than was in 1947. The 1947 plan was, if you look at the map, ridiculous compared to the partition that was envisaged in 1937, which at least had territorial contiguity for each of the basic components and geographically did not disadvantage the Palestinians as much as 1947 did. And yet it couldn't be implemented either. Both the Arabs and the Israelis rejected it at that time. So, it had its logic. It could have been done. It could have been done much more easily, I think, than the single state solution, but it wasn't done that whole period from 1937 to let's say 1997. That was a 60 year period in which it failed as a concept. And I'm afraid we have to be realistic and say this is going to be a very big challenge. Even if the conceptual challenge of how to put the building blocks together can be resolved. It's going to be the work of a lot of very courageous people over a very, very long time.